(Bloomberg) -- Think of it as a potential silver lining for investors. A burgeoning shortage of the precious white metal is promising to boost its price as 2019 rolls out. Silver surged 9.1 percent in December, its biggest monthly gain in almost two years. This year, with miners avoiding new projects amid global economic uncertainty, the price could spike as high as $17.50 an ounce from about $15.36 now, according to a Bloomberg survey of 11 traders and analysts. 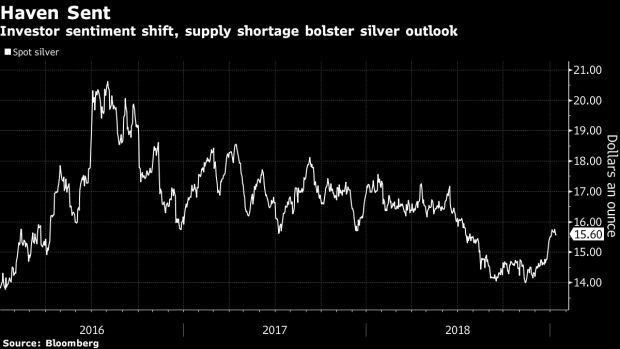 About 26,000 tons of silver is expected to be produced this year, according to estimates by Robin Bhar, a London-based analyst at Societe Generale SA. That would be the least since 2013, and means global physical demand will top supply for seventh straight year. It comes as industrial use, ranging from solar cells to computer touch screens and even medicine, is booming. --With assistance from Caleb Mutua.